Today we look at the topic of organizing paper. Paper is a really common source of clutter. The average disorganized person has 3000 documents at home. It can be even worse on the job. More than one quarter of all employees’ time is spent trying to find lost documents, and 15% of all paper handled in businesses is lost. This results in poor efficiency but can also have profound impacts on individuals’ lives. Lost documents can result in home foreclosures, higher credit card interest and fees, missed appointments, and lost opportunities. Another great reason to organize paper: I’ve had many organizing sessions where my client and I found enough money, in cash and uncashed checks, to more than pay for my services. Statistically speaking, 80% of paper that is filed is never accessed again. Some of that paper, like documents related to past years taxes, must be kept anyway even though it will (hopefully) never be accessed. Even when you take that into account, at least 50% of paper, and this is a very conservative estimate, would not need to have been kept in the first place. What typically happens is that someone will spend a lot of time going through paper and filing it. They will then store that paper, and then some number of years later, they will go through these files and get rid of most of it. This is a lot of time, space, and energy to invest in papers that give you no benefit, and if 50% of paper is in this category, collectively that amounts to a huge waste of time and energy. Imagine the amount of time, space, and energy you would save if you let go of this paper in the first place. If you’re like me, you don’t get any pleasure from sorting and filing paper, so if you’re able to cut down the amount of paper you keep by half, this will give you a lot of time and energy to spend on activities that you are passionate about. Regarding organizing paper, I have some good news and some bad news for you. First the bad news. Paper is the most time-consuming thing to organize. One box of paper can have more individual items than an entire garage, so if you need to go through all the paper on a page by page basis, it can be tremendously time-consuming. The good news is that all of the techniques and strategies that I’ve discussed earlier apply to organizing paper just as they do to any other organizing challenge. In particular, the “Three S’s of Organizing,” apply to organizing paper as well. The “Three S’s of Organizing,” simplify, sort, and store, is a great methodology to use for organizing paper. Now I have even more good news. The most common way to organize paper is by filing, and in filing, the second two S’s of the “Three S’s of Organizing,” sorting and storing, both happen at the same time. Instead of doing two steps, they both happen at once. It’s like you get a step for free! Over the past 10 years, I’ve helped hundreds of clients get more organized, and paper is one of the most common challenges. I’ve had clients who started out with literally more than 200 boxes of paper, and together, over time, we were able to condense and organize this paper so that it became something that contributed to their lives instead of the enormous burden it was previously. It’s been my experience that the most common cause of paper disorganization is simply keeping too much paper, so that important paper gets mixed up with the unimportant paper. Therefore, the remainder of this post will focus on minimizing paper. It will be in two sections. Section 1 is “How to Minimize.” It will include specific things you can do to have less paper in your life. Section 2 will be “What to Minimize.” It’s been my experience that if you’re unclear about what you need to keep, you’ll likely end up keeping too much, so in this section, we’ll look at specific types of documents, and how long they need to be retained. At the end of this article, you will know how to have less paper in your life, you will know what you need to keep and what you don’t, and you will be spending less time on paper and more time on the things you love. Of course, each individual has different requirements for what paper they need to keep. Some professionals, like real estate agents for example, have legal requirements for how long they need to keep certain documents. If you have any doubt, contact an expert in your field. My intention is to inform you about factors to consider when simplifying paper, hopefully some that you previously hadn’t considered. Start by reducing the amount of paper that comes into your life through your mailbox. The less paper that arrives, the less paper you have to deal with. These days, it’s possible to receive a huge amount of paper without even leaving your house. Evaluate newspaper and magazine subscriptions to determine if the benefit you get from them justifies the amount of paper they contribute to your life. Do the same with catalogs. To reduce the amount of junk mail you receive, contact the Direct Marketing Association. The easiest way to do this is to go to their website www.DMAchoice.org. Here you can get information and take steps to reduce the amount of junk mail that shows up in your mailbox on an ongoing basis. Another good way to reduce paper is to subscribe to electronic statements and electronic billing. Almost every organization that sends you a bill, can allow you to receive this bill by email instead of mailing paper statements. You can also pay these bills electronically, and this will have the additional benefit of saving you money on postage. You can also simplify the amount of time you need to spend paying your bills. Many companies you need to pay regularly will allow you to change your billing date. Currently, almost all my bills are paid automatically, but before I set them up on auto pay, I had arranged for all my bills to be due at the same time, on the 5th of the month. This way, instead of paying bills every week, or several times a month, I paid all my bills, including electric, water, trash, rent, and credit cards all at the same time, once a month. I like to keep things simple, and this is a great way to do it, if you still pay your bills by hand. This is easier and less error-prone than having to keep track of bills that are due at different times of the month. Technology can also be used to maintain your schedule, keep track of contacts, and remember things you need to do. You can use a computer or a smart phone to replace hundreds of pieces of paper and Post-it notes. Furthermore, if you synchronize your smart phone with your computer, then you always have a backup, and if you lose your smart phone, you still have all the data on your computer which can later be downloaded to a new phone. On the other hand, if you have a hand written address book, and you lose it, you may not have any way to replace that information. There are also companies that provide services or software to allow you to scan in receipts, business cards, or other paper and then organize them electronically. You can find more information at www.shoeboxed.com or you can google a product called Neat Receipts. In this section, I will offer you principles you can use to be more clear about what paper you need to keep and what paper you don’t need to keep. Remember that generally the value of the paper, the benefit that you get from it, is the information inscribed on that paper. In rare cases, like in the case of a birth certificate, there is reason to keep this specific piece of paper. But generally, there is no inherent value in the paper itself — it is the information on the paper that is valuable. So with paper, we are most often talking about information, and that makes it different than organizing objects like tire chains, tissues, or exercise equipment. If the information on that paper can be accessed in some other way, it’s not necessary to keep that paper. For example, have you ever printed out a page on a website? This is a perfect example of paper that contains information that can be obtained elsewhere. You can just go back to that website. Furthermore, the printout never changes and can become outdated. So it’s possible that when you look at that printed copy in the future, the information there will be obsolete. On the other hand, the website itself is more likely to be updated, so going back to the original website will likely result in more accurate information. I once had a client named Cynthia who was a real estate agent. In the 1970s, she took a course on property management, and still had the course binders, which took up a huge amount of space. I encouraged her to get rid of these binders. There’ve been huge amount of changes in the property management profession in the past 35 years. As a result, it’s likely that the information in these binders would be out of date and incorrect. As a licensed professional, if she were to use this information when representing a client, not only when she be doing a disservice to her client, but she could possibly even get sued as a result. My point is that it’s better to have no information at all then to have out of date information. Out of date information gives you a false sense of security. It makes you feel like you know something when, in reality, you don’t. If you have no information at all, then you would be forced to obtain up-to-date information at that time. These days we have access to unprecedented amounts of information. With an Internet connection, you can most likely arrange to see copies of all your recent bank statements, read the latest book and movie reviews, see how your utility bills compare with last year, check out articles from your local newspaper, and get directions to the nearest pizza place. All this information can be accessed at the moment it’s needed rather than stockpiling documents that you might need someday. I have a friend who recycles all the user’s manuals to all the products she buys because she knows she can always access the user’s manual from the company’s website. So now let’s be more specific. Let’s look at different types of papers and whether or not you need to keep them. Of course, I am not going to list all the possible different types of paper that exist. I’ll just pick out those types that often cause confusion. Taxes. I am not an accountant or CPA, and I am not giving any advice or recommendations on how to do your taxes. I am just passing on information from the IRS about the statute of limitations for tax related documents. According to the IRS, the most you would need to keep tax returns and all supporting documentation is seven years. You may wish to keep the actual returns longer than that, but you can definitely let go of receipts and supporting documentation after that time. Receipts. There are a number of factors to consider when deciding whether or not to keep receipts. First, are you self-employed? If you are, you will want to keep any tax related receipts for as long as you need to keep the supporting documentation for the tax year they are associated with. Second, do you own your home? If so, you need to keep receipts for any capital improvements for as long as you own your home. Third, is the item under warrantee? If so, you will definitely want to keep the receipt until the warranty expires. Finally, you may wish to keep receipts for big-ticket items like furniture, appliances, cars, and other major expenditures. This information may be useful if the item ever needs to be fixed, or if you decide to resell it. Bank statements. The first thing to remember is that bank statements can generally be accessed online. If you are able to do this, then there’s no need to keep the paper. Furthermore, at the end of every year, you will receive a statement that tells you how much interest you earned on that account for that year. This is the only thing you need for tax purposes. Once you have this, you can let go of any bank statements you’ve collected over the year. Make sure any paper that contains account numbers or Social Security numbers are shredded to protect you from identity theft. Credit Card Statements. Again, they can generally be accessed online. Furthermore, you may receive an end of year summary from your credit card company summarizing all your charges for the entire year. If this is the case, then you would be able to let go of any statements for the time period covered by that summary. Utility bills. If you’re not self-employed, then there’s no reason to keep utility bills other than to verify that your payment has been received. When a new statement comes in, I generally let go of the bill for the previous month. That way, I only keep one month’s worth of utility bills at a time. In summary, today we looked at why to minimize paper, how to minimize paper, and what paper to minimize. Hopefully now you’re clear about what paper should stay and what should go. 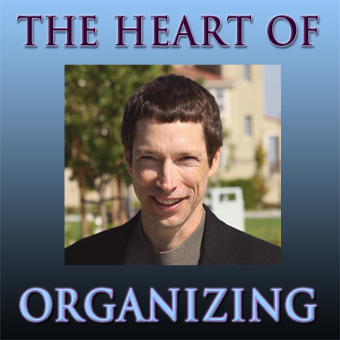 You are currently browsing the The Heart of Organizing: A Blog blog archives for February, 2011.